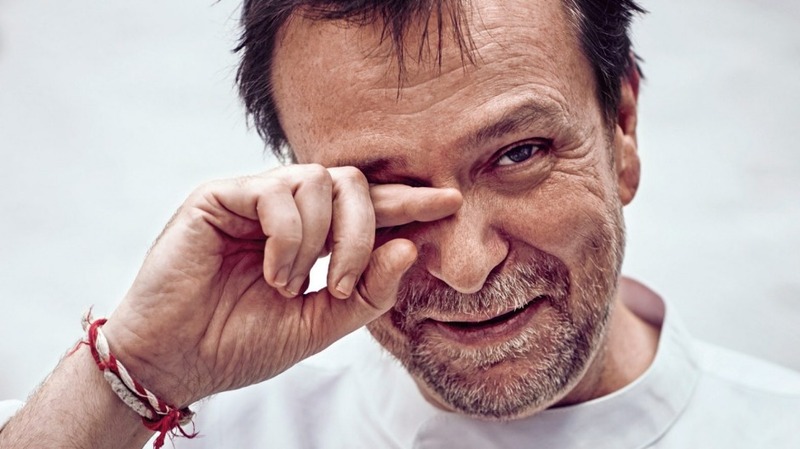 David Thompson: Not a fan of being called a rock star chef. Australian-born chef David Thompson has long called Thailand home – but these days the owner of Bangkok's high-flying restaurant Nahm is often to be found on a plane jetting between his Long Chim street food canteens in Singapore, Melbourne, Sydney and Perth. What's your favourite Thai recipe? It could be something as easy as a stir-fry with holy basil. At the moment we're putting on at Long Chim some fried rice with salted fish, which sounds a bit whiffy but is salty, rich and wonderful. 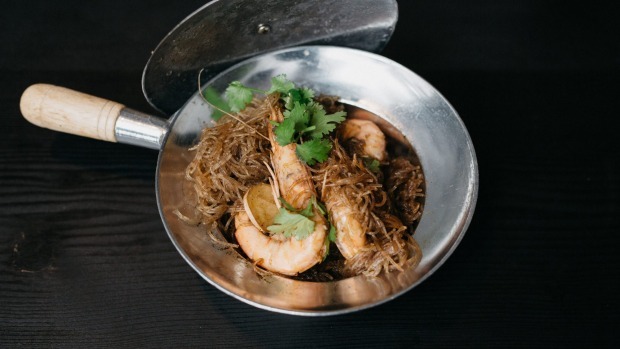 Baked prawns with glass noodles at Long Chim. David Thompson says he now loves his carbs. My favourite thing is noodles and I think one of the reasons I opened Long Chim was to cook noodles. I've always been a bit too fancy and a bit too precious to lower myself to noodles but now I love them. A man of a certain age needs to drop all pretence because it's important. I can admit it now: I love my carbs. I love sugar, fish sauce and garlic, garlic and garlic. I use Australian garlic here and in Thailand I prefer to use the Thai garlic, which is much sweeter and rather like spring garlic. Vegans – yes or no? I love them. I adore vegans. Somebody's got to. I've now finally found some vegetarian fish sauce. It's taken a while but I'm delighted because one of the biggest problems I've had is doing a vegetarian curry – the taste is so compromised with using just salt; it doesn't have the funk. My next endeavour will be to find vegetarian shrimp paste. It's impossible to have a proper green curry without it. It won't be long before we're skipping through those wonderful verdant vegan fields. If it's in Thai food, it's pork or fish. I don't like pork in Western food. I know, it's irrational. In Thailand, if you give me some stir-fried pork or red pork in Chinese cooking, I'm yours. F--- the vegans, we'll go straight into carnivore mode. 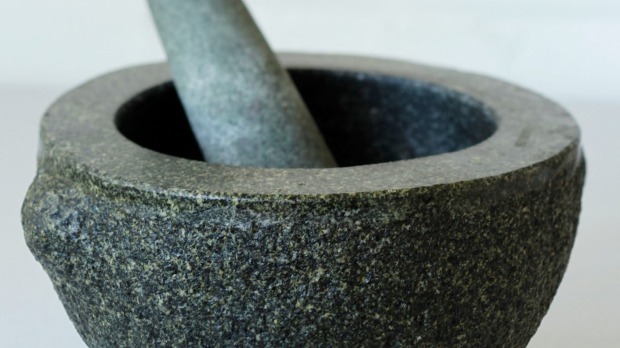 A pestle and mortar is my sturdy, stalwart friend. Granite and Neanderthal, it can be used in all aspects of cooking – it doesn't care what cuisine it's pounding in. It can be used for purees, it can be used for sauces, pastes, for making mayonnaise, it's great for aioli and it can even be used as an ashtray in my house. I'm a moody bugger. I've now become less inclined to drink than ever before, much to the disappointment of my friends, particularly those who enjoy the pestle and mortar as an ashtray. I used to drink for my country and I had three countries. I've got onto more classy stuff. If I'm going to be tempted into booze it's got to be a damned cracking pinot noir. I'm still partial to a beer because you can't forget your roots, and I'm still looking for the perfect cocktail. I'm not persuaded by negronis. I've gone through the whole range of cocktails based upon every spirit known to man and every combination of every spirit known to man in the one glass. Never found anything that makes me go, "mmm that's my tipple", as opposed to a really cracking riesling. But I'd rather not talk about it because I have a reputation to uphold. It shows you how silly and simple I am but I was about three hours north of Bangkok and there were these old women cooking in the most unlikely place – some really nice curries, just nice country Thai food. The thing I remember most of all is one of them said, do you want some dessert? She went out the back and picked some green mangoes from a tree and peeled them and presented them just as they were and the taste was just outstanding. To me it was the immediacy, the locality, the ease with which they did it, the unpretentiousness of it all, and the fact that it was just there. No, I have only one piece of jewellery – a wedding ring. I hold dual citizenship of a country that allows me to get married. I think we got married on July 13. I get into trouble for not remembering. But I do remember the 9th of July 1988, when (Tanongsak Yordwai) and I first met. We got completely slaughtered on tequila in a cheap bar in Bangkok. For our wedding in Britain, Angela Hartnett cooked for us, we drank some very decent red wine, some beautiful Nuits-Saint-George, some delicious white burgundy, some very good Dom Perignon. Everybody got very drunk. How do you feel about being referred to as a rock star chef? It's just preposterous. I so dislike these silly titles. If you do your job right and do it well, then that's great. But should you be celebrated for that? No. It can create false illusions for those coming into the industry. It's not about having your photograph taken, but it's an unfortunate corollary. Among all the cooks I know there's a complete separation from the public's persona to their private person. It wasn't Thai food. Being a rock star, I did television yesterday and I filmed a session with a guy called Miguel Maestre, a very jubilant Spaniard. He was so sweet and cooked some arroz, a pseudo paella which was just delicious. Chorizo, a little bit of chicken, rice, olive oil, manchego cheese and saffron. Delicious. At times I'm sick of Thai food. God, I need a break from my own cooking. How much heat can you handle? I can go all the way and sometimes I can be very timid. It depends on the mood and the context. It shows you how circumstantial food and taste can be. The hottest thing I've had in my mouth is the Carolina Reaper. The Thai chilli is about 5000 on the Scoville scale whereas the Carolina Reaper is 1.5 million. I'm psychologically scarred forever. The psychiatric industry could employ it as an alternative to a lobotomy or electric shock therapy. A friend of mine brought it into the restaurant in Bangkok last year and said, beware, this is really bloody hot. With a professional rock star's disregard I had a small slice and it was like a hot nail hammered through my tongue. It kept on building up and building up and getting hotter and hotter as time went on. Thai chillies are polite – like the Thais they'll slap you around a bit and then they'll leave, whereas this one just kept increasing in heat. I became a howling creature full of pain, just running around the kitchen. It took an hour and a half to dissipate. All the Thais in the kitchen were laughing at me so I fixed them. I got them all to have a slice of it too and then they were running around in circles screaming. I had one guy on the floor saying, "Just call an ambulance, call a hospital". I thought I'd have to close the restaurant because I'd knocked out half the chefs. For some reason, I'm now uncertain whenever they offer me a share of something to eat. The weirdest thing you've tasted? Placenta. A cow's placenta in the north-east of Thailand. As bad as it sounds. The most unusual thing I've ever tasted was a fusion dish made by one of my chefs who used some of our larb powder on nachos and cheese. It was so preposterous but it actually worked. I fired her, of course.